THE Eiffel Tower took two years to build, Norman Foster’s Gherkin tower needed three, but four years of roadworks in Bloomsbury have produced... half a cycle lane. 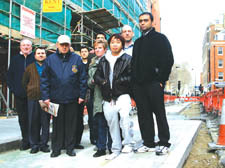 Work began on the cycle lane in Tavistock Place in 2004. It was finished, then redesigned to separate it from the road and is now being upgraded again. Philip Howard, a design consultant at Howard Wickberg Associates, whose office overlooks the road repairs, estimates the seemingly never-ending work on the cycle lane has cost in the region of £1 million, without considering the financial damage to businesses. “Either the cycle lane or the road has been closed in one form or another for four years,” Mr Howard said. “It opened two weeks ago – now they’ve dug it up again, for the fourth time. He fears that it is only a matter of time before someone is killed as a result of the disruption. Waiter Suhjid Meah has never seen the street without roadworks in the four years he has been at Tavistock Tandoori. A Camden Council press official confirmed that in the last four years the cycle lane had been built, then “revised” on the suggestion of the project’s funders, Transport for London, to separate the cycle path from the road. The pavement was then upgraded, the carriageway resurfaced and a fire in a nearby Salvation Army hostel caused the road to be closed for 15 months. The official added that the cycle lane was now being upgraded again, to “allow eastbound cyclists to merge safely into the traffic lane before they reach the junction”.